The first step to becoming savvy inside WordPress is to understand the differences between WordPress.com and WordPress.org. They share the same logo, name, and many of the same features, but that’s where the similarities end. Anyone can sign up for a free WordPress.com account and get a free site at yourname.wordpress.com. Paid upgrade bundles include yourname.com, custom themes, custom fonts, increased media storage, no ads, and more. Little to no start up cost. Little to no technical skills required. No security or optimization required. Great for entry-level blogging and getting your feet wet. You are not allowed to monetize your site through the use of ads or affiliate links. You do not have access to WordPress plugins. You have limited theme options and no custom coding ability. You are limited to 3GB media storage. Ads may be visible on your site (to viewers who are not logged in to a wordpress.com account of their own). WordPress.org requires purchase of a domain name (through a domain name registrar like NameCheap or through your host) and website hosting (through a reputable web host). Your domain name needs to point to your web host and WordPress.org needs to be installed on your web host. You are free to monetize your site through ads or affiliate links. Unlimited theme, plugin, and customization options. Unlimited image and file storage (depending on your host). You have complete control over every aspect of your site. No ads will be displayed unless you choose. Recurring fees for domain name and hosting. Installation and customization requires some technical knowledge. Problems may require hiring technical assistance. You are responsible for your site’s maintenance and optimization. You are responsible for your site’s backups and security settings. A free WordPress.com account is great for beginning bloggers. But if you have books to sell or want to monetize your site, you’ll get a better deal paying for hosting for WordPress.org than paying for all the custom upgrades with WordPress.com. Design By Insight: wordpress.org & wordpress.com: what’s the difference? 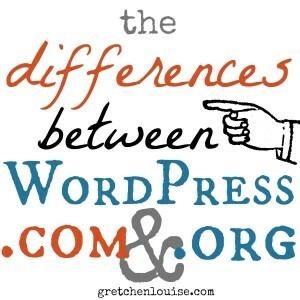 Blogging With Amy: What’s the Difference Between WordPress.com and WordPress.org? WPBeginner: Why is WordPress Free? What are the Costs? What is the Catch? WPBeginner: How are WordPress.com and WordPress.org Related? Sooooo if I want to switch to a wordpress.org site then how do I do that without loosing all the work I’ve done on my wordpress.com site? I’d eventually love to monetise and if I can’t do that on wordpress.com I’m better to switch to wordpress.org now. I already have a domain name that I purchased really cheap from namecheap before signing up to wordpress.com and realised that I couldn’t use it without upgrading to a paid plan. I also find it annoying that I can’t access plugins on wordpress.com until I upgrade to a business plan ($33/month). I’m not ready to monetise, but I know I the future I do really want to, to give me some residual income/ replace it all together. Help! I haven’t checked the terms lately, but it’s possible you may be able to monetize on the Business Plan now. To switch from .com to .org, you’d just do an export/import of your content/images. Gretchen, you explain the differences so clearly and succinctly. Thank you for this great blog post. I am so excited about this series! I have a wordpress.com and I did not even know there was such a thing as wordpress.org until I read this! I was wondering why some customizations I wanted were not available and now I know why! I can’t wait to read the rest!! I saw you tweet about this post recently and wanted to stop by. We recently switched from WordPress.com to WordPress.org, and we are glad we did so. We feel this gives us more freedom with our blog, and my husband is very technically inclined, so that is a bonus for sure. 🙂 Thanks for this series. We’re looking forward to reading along! I’m going to love your series! I need so much help! I just moved my blog to WordPress. Thank you! Thank you! I blog on wordpress.com but am working with a designer to create a new blog that will be moved to wordpress.org soon – maybe by the end of October. My 31 Days series is 31 Days of Do Over, so “doing over” my blog fits right in! In the meantime, I am looking forward to reading your series and learning more about both .com and .org. What an appropriate name for your series! I’m glad the timing of mine is helpful to you. Looking forward to hearing how your move goes! I love wordpress.org – I’ve used it for many sites including my current project. A fabulous website tool for those with little or lots of website experience! Agreed! Your site is a beautiful example of what WordPress can do.